SUMMARY: Tooth development for children is a continuously transformative process until they reach adulthood. Here is a breakdown of the growth. Incisors are the front upper and lower teeth. When you take a bite, incisors work together like scissors to cut through food. Canines are the sharp, vampire-like teeth that border both sides of the incisors. Canines work to tear apart food. Premolars are the flat-surfaced teeth in the back of the mouth behind the canines and crush food. Molars are behind premolars and are larger than premolars. They are also flat and designed to grind food. Enamel is the toughest layer and the white outermost coating of a tooth that you see. In fact, it is the hardest material in the entire human body. Dentin is the body of the tooth and found beneath the enamel. Pulp is a soft part of the inner tooth that produces dentin and contains nerves. Root is the part of the tooth that attaches the tooth to the jaw. Typically children have 20 primary teeth, while adults have 32 permanent teeth. Fetuses start developing teeth early on in pregnancy. In fact, the baby's first tooth tissue buds during week six in a mother's womb. The enamel begins to develop when the fetus is three to four months old. When the baby is born, he or she typically has 20 primary teeth beneath the gums, according to the American Dental Association. 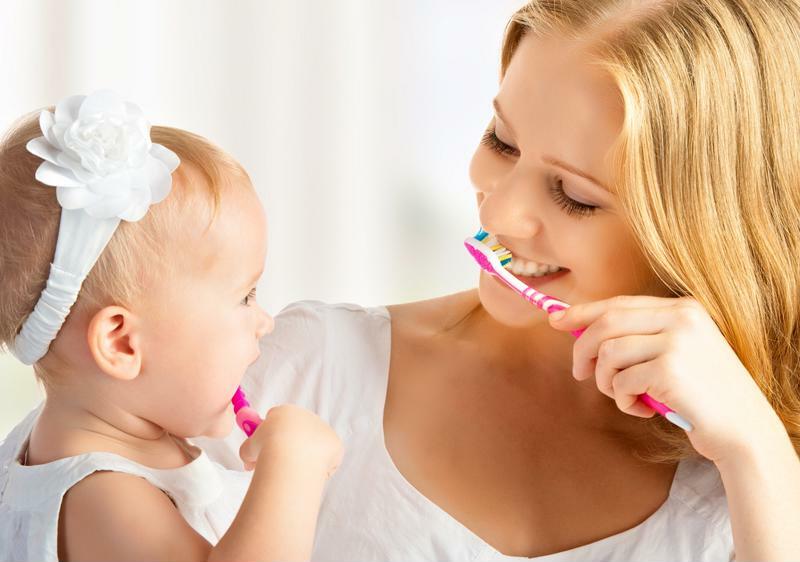 Starting around six months old, a child will begin teething, a process where the primary teeth erupt through the gums into functioning teeth. According to the Dental Health Foundation in Ireland, children usually have all of 20 of their primary teeth showing by 24 months. The teeth commonly erupt in a certain order: incisors, premolars, canines and molars. Beginning at five years old, permanent molars begin to erupt. These molars come in behind the last primary tooth, so no baby teeth are lost. Next, the central incisors in the lower jaw fall out to make way for the permanent incisors. While this is the standard order, each child is different and may lose teeth at different times or in a different sequence. From age five to 11, children lose their remaining baby teeth, which adult teeth replace. Around age 11 or 12, children gain their second molars. These are the farthest back teeth that erupt before the wisdom teeth, which appear around 17 to 21 years of age, according to the ADA. However, not everyone develops wisdom teeth. Sometimes, none form, and other times, only a few form. Nonetheless, if all teeth form, there will be 32 teeth in a fully formed adult mouth. "Losing teeth may be painful for children." Although it is a natural process, losing teeth may be painful for children. According to the Victoria State Government, this is especially the case for young children. However, some children do not experience any pain. As a parent, you may need to help your child deal with the process physically and emotionally. The Victoria State Government explained that parents should comfort children by explaining to them that everyone goes through the process of losing baby teeth and getting adult teeth. For the pain, a cold compress or over-the-counter anti-inflammatory medications will reduce discomfort. Speak with your child's dentist or health care provider for more recommendations on mild pain-relieving medications that best suit your child. What stage of tooth development are your children going through?